Satyakam Homes is an agency based in Goa, India, owning properties in Goa and Bombay. Started in Jan 2009 and headed by Mr. Jude Cardozo, this agency caters to discerning clientele from all over the world and specializes in providing apartments for sale in Goa & Mumbai. If you are planning to buy an apartment in Goa then your search for a comfortable beach apartment ends here. The soaring price of real estate in Goa makes Goa an ideal choice for investing in real estate. We have apartments and shops for sale in South Goa and North Goa in premium locations. These apartments for sale in Goa promise great returns in a short span of 3 to 4 years. While the prices soar, these apartments can also be rented out to tourists and others as there is never a shortage of demand for apartments in Goa. Currently we own apartments and shops for sale in South Goa and apartments in North Goa. 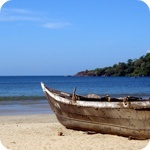 These beach apartments are ideal for those who want to settle down to the tranquil and peaceful Goan life. Some of the Beach apartments are close to the beach ie 5 minutes walking distance while others are about 1-6 kms from the Beach. All beach apartments are competitively priced and are value for money. The beach apartments are single bedroom, double bedroom and three bedroom. Looking forward to seeing you in Goa soon….Deu Borem Korun!! !